Today, I have decided to take a break from all the Christmas cooking and post about my most memorable meal of 2015. Just over a year ago, Neil and I returned to the Lake District after attending my Godmother’s birthday celebration nearby. Some months prior to our trip, Neil let slip that he had booked for lunch at L’Enclume, somewhere I had wanted to eat for several years! Needless to say I was absolutely thrilled and started counting down the days until our meal. 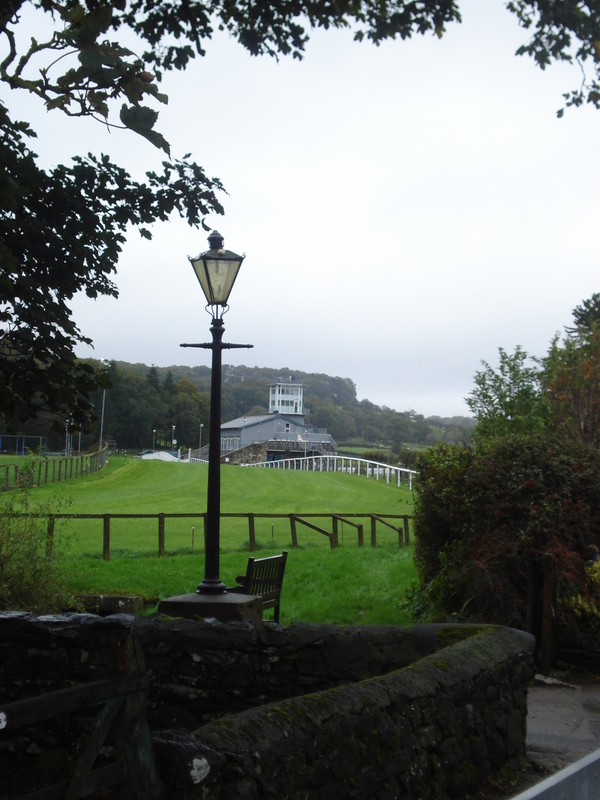 I love the Lake District, in particular Cartmel, it really is the perfect setting for the restaurant. It really is such a beautiful village, situated right in the heart of the South Lakeland countryside – not only is it beautifully picturesque, it is also a foodie haven with plenty of little shops, pubs and restaurants, not to mention the star of the show, L’Enclume. If you are fortunate enough, you can even stay at the famed restaurant enjoying dinner at L’Enclume and breakfast the following day at the sister restaurant, Rogan & Co. The 800 year old building which previously housed a smithy began its life as a restaurant in 2003 under head chef Simon Rogan. In 2008, L’Enclume was granted one star in the Michelin Guide with a further star following in 2012. The restaurant has been granted numerous awards over the years, in fact it was again named the UK’s best restaurant for the fourth year running in 2016; L’Enclume even featured in Rob Brydon and Steven Cogan’s comedy series ‘The Trip’ in 2010. Simon Rogan is an extremely talented chef with a further restaurant in Cartmel, two restaurants in nearby Manchester and one in London at Claridge’s; at a young age he developed his flair and passion for Michelin started food whilst working under such world-famous chefs as Jean Christophe-Novelli and Marco Pierre White; this gave him a solid grounding in the level of skill and talent required to make it in the restaurant trade at such a high level. Needless to say I was keen to find out whether all the hype lived up to expectations…. The first thing that struck me about L’Enclume upon entering the restaurant was the laid back, minimalistic style. There is nothing fussy or pretentious about this place, nothing stuffy or uncomfortable. The local area shines through the restaurants natural, easy decor – through the white washed stone walls highlighting the aged buildings charm, to the simple wooden tables adorned with local stoneware and pottery. I loved how relaxed L’Enclume was from the outset as it really allows the wondeful food to take centre stage. We opted for the 6 course lunch menu which was fantastic value at £55 with a further £40 for the paired wine flight; a cheese course is an additional option. A 17 course menu is also available should you wish to indulge – it certainly looked wonderful! Our waiter talked us through the menu and of course, a little about the ethos of the restaurant. 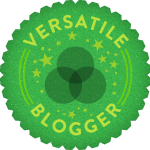 As readers of this blog will know (if I still have any readers after such a long hiatus! ), I am a big fan of local producers and local ingredients as mentioned in my recent post about our mini moon to The Pig, Near Bath. Simon Rogan owns a 6 acre farm in the Cartmel valley, affectionately called ‘Our Farm’. Over 90% of the food served at the restaurant comes from this very farm which ensures that all dishes are seasonal, local and showcase the very finest and freshest ingredients possible. A huge amount of dedication and vision is involved in such a process and the attention to detail and origin is evident in the faultless dishes served back at L’Enclume. Further information about Rogan’s culinary concepts and farming approaches can be found in ‘Kitchen Garden Experts – Twenty Celebrated Chefs and Head Gardeners’ by Cinead Mcternan, well worth a read! For our first course we were treated to ‘Cod Yolk’, a variation on fish and chips! Firstly….how beautiful is the local pottery?! I love the vibrant blue which really highlights the subtle colours of the food. This dish clearly highlights Rogan’s ingenuity with a clever spin on the British classic, fish and chips. The salt and vinegar puffed rice offered a really good contrast in taste and texture to the creamy ‘yolk’. To accompany our meal, we were given some bread and butter. Of course this wasn’t any old bread but apple sourdough, accompanied by pork fat! This may sound disgusting but it was absolutely delicious, very indulgent but very yummy at the same time. Another dish, another beautiful piece of pottery! Although the broth looks very delicate it was full of flavour and most definitely packed a punch. I really liked the addition of the cheddar which added a little sharpness to cut through the pork fat. I was really pleasantly surprised by this course. This was Neil’s favourite dish of the meal and it came a pretty close second for me. I must admit I was quite surprised it was such a hit with Neil as he really isn’t a fan of raw meat or a massive fan of mustard – that goes to show the level of expertise at L’Enclume. The beef was ‘melt-in-your-mouth’ tender! The apple added a nice balance of sweetness and acidity alongside the mustard. I also loved the presentation of this course, it is so colourful and you can tell that so much care and attention has gone into it looking just right. I really really enjoyed this course and it was hands down my favourite dish. The guinea fowl was lovely and tender with a crispy skin and, dare I say it, the beetroot was out of this world! I am not a huge fan of beetroot of the pickled variety which has most likely put me off from buying the root for other purposes. This plate showcased a couple of different ways to cook beetroot including pureed – the puree was so creamy with a hint of citrus which really complimented the earthy flavours on the plate. For our first dessert, we were treated to plumbs with apricot kernels and honeycomb. The creaminess of the plumb ice cream went perfectly with the crunch of the kernels and honeycombe. Rogan is clearly a master in contrasts and complimentary flavours as all of his dishes contain perfect juxtapositions which make the plate so much more interesting, challenging and enjoyable. For our final dessert, we enjoyed a seasonal blackberry dish complete with edible flowers! I really love blackberries, particularly as they are synonymous with the British countryside and beautiful hedgerows; we even made bottles of blackberry liqueurs for the guests at our wedding in August! 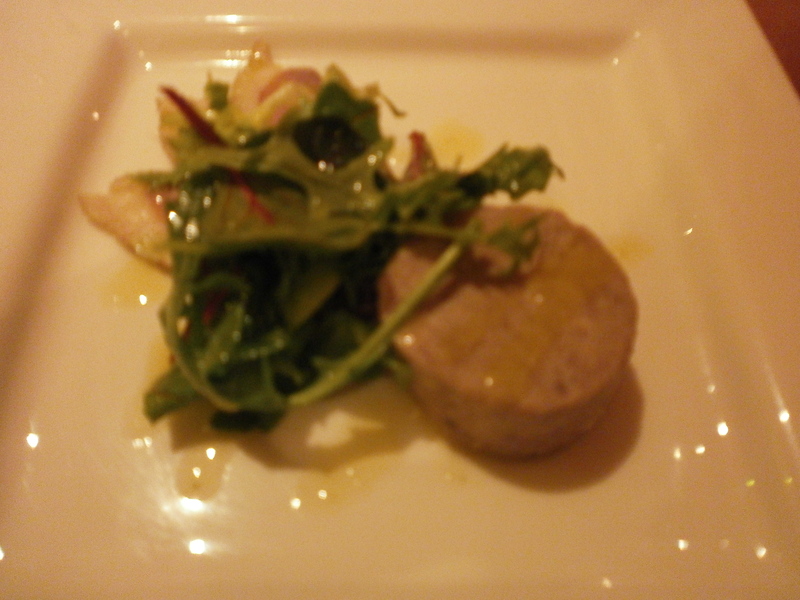 This dish was obviously a bit hit with me and, in my opinion, was one of the most beautifully presented. The blackberries were plump, juicy and not too tart and I loved them combined with almond, another favourite flavour of mine! Yet again, another beautiful piece of stoneware from the local area showcased the dish perfectly. As we are cheese fanatics we couldn’t leave without sampling a bit of the mighty impressive cheese trolley! The only downside to our meal was that our waiter had evidentially forgotten that we requested the cheese after our dessert (the English way rather than the French!) so we had a bit of a long, uncomfortable wait before managing to remind him over half an hour later! Luckily, the cheese was well worth the wait as was the delicious chutneys, red onion & cinnamon and grape & raisin, which are made from produce from the farm and garden. I had never thought of including cinnamon in my red onion chutney but will have to try that at some point as both of the chutneys were stunning! Our meal at L’Enclume was certainly a memorable one, even some 14 months later! It is just shameful how long it has taken me to write about it. If you ever plan a trip to the Cartmel area, seriously think about making a reservation at L’Enclume – you will not regret it! Mr Memoirs of an Amateur Cook and I visited the Lake District a few years ago for Mr MAC’s birthday. Being October, the weather was cold and a bit dreary but we still had a lovely time and managed to take in a lot of the local sights. One of my favourite finds on the trip was the village of Cartmel which was only a 10 minute or so drive from where we were staying on the outskirts of Grange-over-Sands. Cartmel is a medieval village in the heart of South Lakeland which features beautiful scenery, a Priory and one of the UKs most unusual racecourses as well as lots of foodie delights in the shape of shops, pubs, restaurants and even a Michelin Star restaurant, L’Enclume (a must for next time we visit I think!!). On the Sunday during our visit, we decided to have a roast lunch at the Pig and Whistle in Cartmel. Although fairly traditional, the food there really was excellent. This pub, as well as L’Enclume, is owned by Simon Rogan. From memory, I believe we both had lamb which was not at all fatty and every element of the dinner was packed with flavour. One course was £8.95 so very good value for such a good quality Sunday lunch. 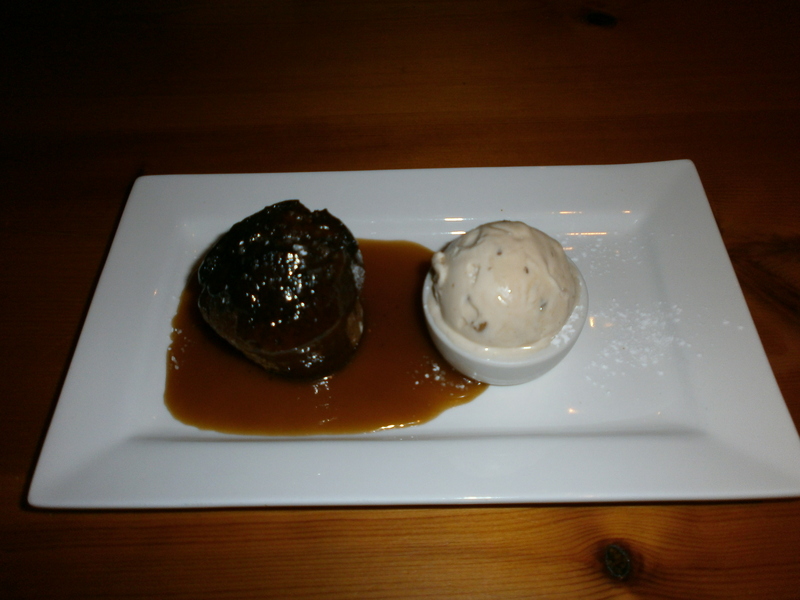 As we were in Cartmel, home of the Sticky Toffee Pudding, I really couldn’t resist having a dessert of the same. It was wonderful and although my first taste of sticky toffee pudding, it lived up to expectations and I have the feeling that all other versions will now pale in comparison!! After lunch we had a wander around the village, looking in the various foodie and gift shops as well as stopping for a drink at The Cavendish Arms. Of course, I could not resist a visit to the Cartmel Village Shop, who sell delicious sticky toffee puddings as well as many other foodie treats. In fact, the puddings made here are sold all across the county and are even stocked in some shops local to me in Northamptonshire. Another place well worth a visit when in the Lake District is Holker Hall, the Cavendish family home. We only paid a fleeting visit here and unfortunately, as we hadn’t done our research, the Hall was closed the day we were there so we kept ourself happy with the food hall, shop and tea room. The food hall stocked a lot of local produce including meat from the estate. Whilst in the tea room, I sampled possibly the best scone and jam I have ever tasted in my life. Unfortunately, it was a little pricey but well worth it. My only regret is that I didn’t buy some of the Holker jam that was sold in the food hall!! For our last night in the Lake District, which was in fact Neil’s birthday, we stayed at Dene House in Windermere. I cannot recommend this B&B enough; not only were we extremely well looked after, the B&B is fantastically located, stylish and very reasonable. 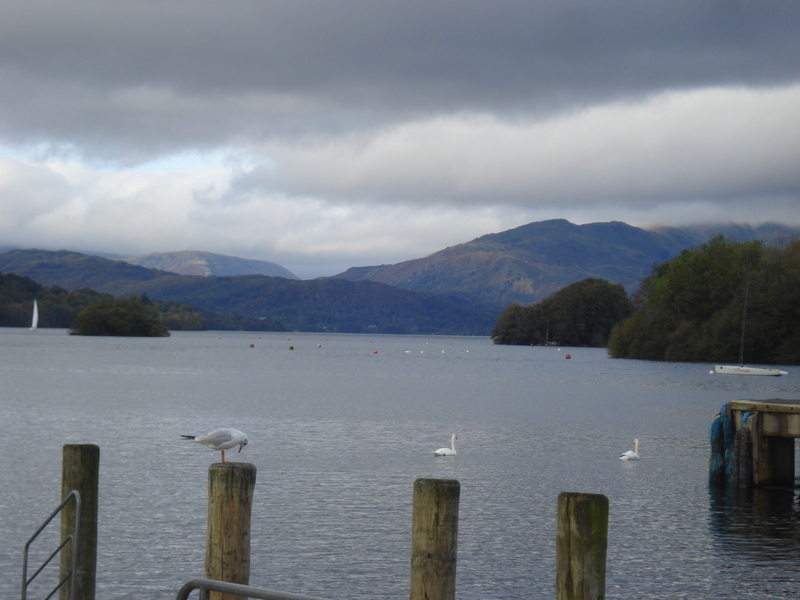 Although the weather was utterly rubbish, we still had a lovely day going out on the lake and enjoying browsing the shops in Windermere. That evening, we went to Postilion Restaurant for dinner. My boyfriend found this place on-line and we booked prior to our visit. When we walked past during the day, we weren’t that impressed with how the place looked and were wondering whether to go elsewhere. 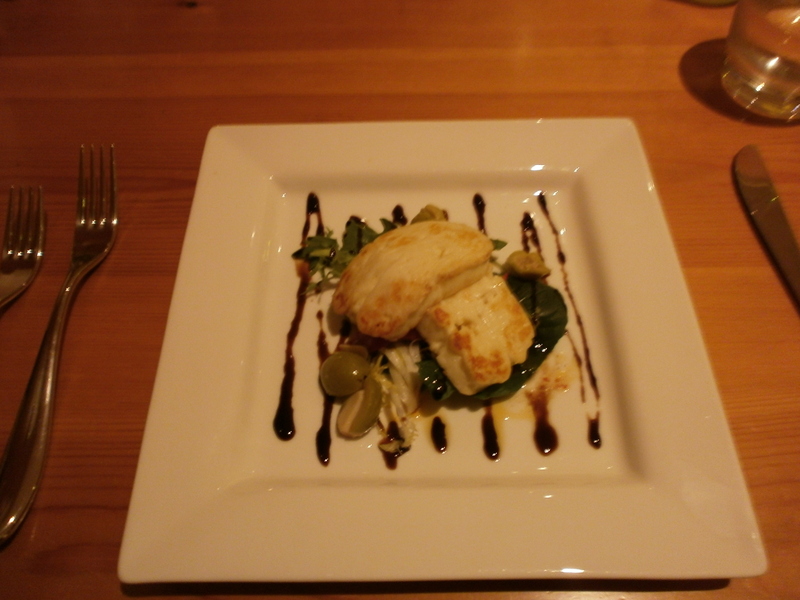 We were so glad that we didn’t as the meal at Postilion was one of the best we both had eaten in some time. 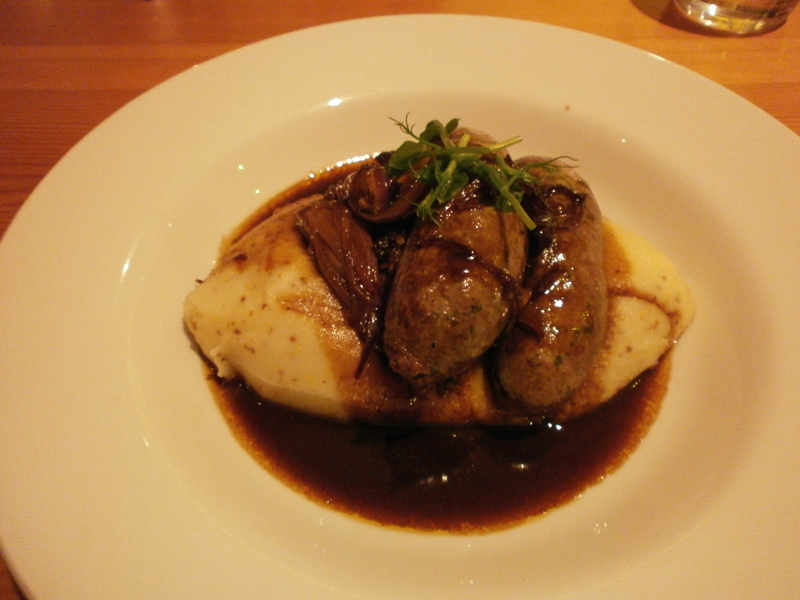 The menu has changed a bit since we were there last year but we both had ‘Three Little Pigs’ – Chorizo wrapped Cumberland sausage, on a bed of mushy pea, bacon and Lancashire cheese mashed potato served with a creamy tomato sauce (Mr MAC as a starter and me as a main course). 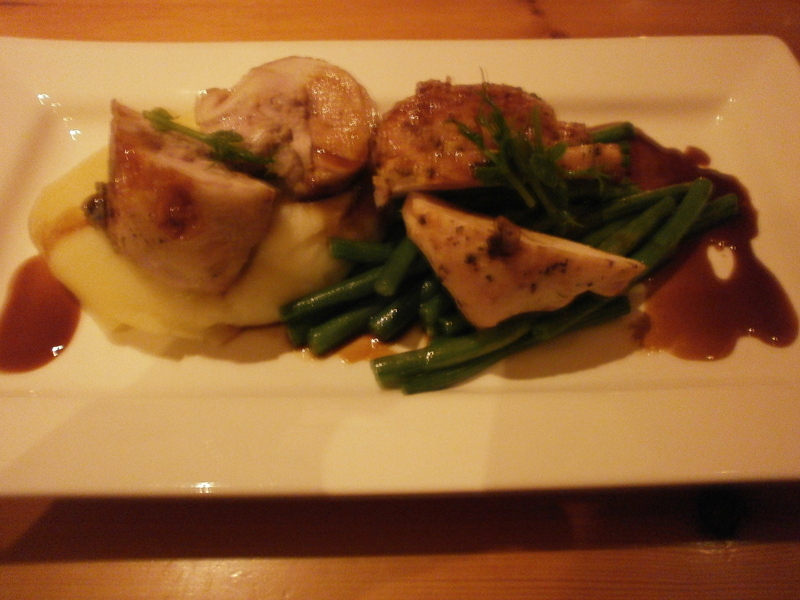 The dish really was fantastic and the meal was very reasonable; I would highly recommend a visit if you are ever in Windermere. I hope you enjoyed some of my recollections about the Lake District, there are some really fantastic foodie places to visit and tons of tons of farm shops stocking luscious local produce.